DEVELOPMENT NEWS 26 • SHOPPING CENTER BUSINESS • June 2018 in Greenville County. The development will be situated on 40 acres, roughly 10 miles south of downtown Greenville. Hughes Investments will build upon the existing 430,000 square feet of neighboring office facilities that house Spectrum, Samsung Electronics America, Jackson Marketing and Greenville Heath System's Regional Distribution Center. Phase I of BridgeWay Station will total 1 million square feet and include 300,000 square feet of retail, more than 180,000 square feet of Class A office space, 380 multifamily units and a 175-room hotel. In addition, the development will include a community center, 16 acres of green space and pedestrian and bike paths with proposed connectivity to the Swamp Rabbit Trail, a 20.6-mile multi- use greenway system, across I-385. 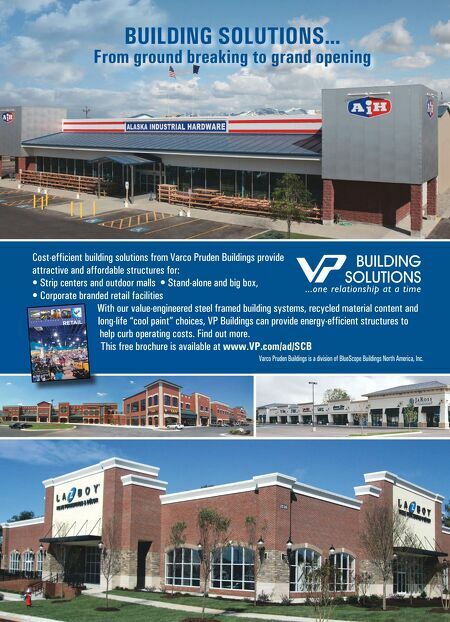 Dawn Prince Hoover of The Shopping Center Group is handling the leasing assignment for BridgeWay Station. Construction on the first phase of the project is expected to be complete in 2020. WHEELING, ILLINOIS LYNMARK BREAKS GROUND ON RETAIL PROPERTIES AT WHEELING TOWN CENTER The Lynmark Group has broken ground on three new retail tenants at Wheeling Town Center, a mixed-use development in the Chicago suburb of Wheeling. The new tenants include CMX Cinemas, City Works Eatery & Pour House and Starbucks Coffee. In addition, the developer unveiled new dining and entertainment concepts that will join the development in early 2019 — Mia's Cantina and 312 Nails & Spa. Wheeling Town Center features 100,000 square feet of retail, restaurant and entertainment space, as well as a 300-unit apartment building. POMPANO, FLORIDA CORDISH COS., ELDORADO RESORTS TO CO-DEVELOP 223-ACRE MIXED-USE PROJECT The Cordish Cos. and Eldorado Resorts Inc. have formed a 50/50 joint venture to plan, design and develop a new 223-acre mixed-use project in Pompano. Located 35 miles north of Miami and roughly 10 miles north of Fort Lauderdale, the project will encompass the site of the existing Isle Casino Racing Pompano Park. Eldorado Resorts owns the 223- acre site around the casino and racing track. The development will include a corporate office campus, residential units, retail, dining, entertainment space and a hotel. 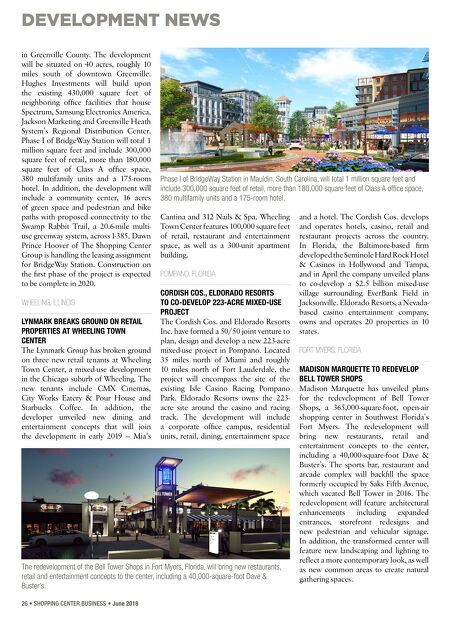 The Cordish Cos. develops and operates hotels, casino, retail and restaurant projects across the country. In Florida, the Baltimore-based firm developed the Seminole Hard Rock Hotel & Casinos in Hollywood and Tampa, and in April the company unveiled plans to co-develop a $2.5 billion mixed-use village surrounding EverBank Field in Jacksonville. Eldorado Resorts, a Nevada- based casino entertainment company, owns and operates 20 properties in 10 states. FORT MYERS, FLORIDA MADISON MARQUETTE TO REDEVELOP BELL TOWER SHOPS Madison Marquette has unveiled plans for the redevelopment of Bell Tower Shops, a 365,000-square-foot, open-air shopping center in Southwest Florida's Fort Myers. The redevelopment will bring new restaurants, retail and entertainment concepts to the center, including a 40,000-square-foot Dave & Buster's. The sports bar, restaurant and arcade complex will backfill the space formerly occupied by Saks Fifth Avenue, which vacated Bell Tower in 2016. The redevelopment will feature architectural enhancements including expanded entrances, storefront redesigns and new pedestrian and vehicular signage. In addition, the transformed center will feature new landscaping and lighting to reflect a more contemporary look, as well as new common areas to create natural gathering spaces. Phase I of BridgeWay Station in Mauldin, South Carolina, will total 1 million square feet and include 300,000 square feet of retail, more than 180,000 square feet of Class A office space, 380 multifamily units and a 175-room hotel. The redevelopment of the Bell Tower Shops in Fort Myers, Florida, will bring new restaurants, retail and entertainment concepts to the center, including a 40,000-square-foot Dave & Buster's.